This article was originally published in Oct 1998 as a “Gary Robson on Captioning” column for a magazine called Newswaves for Deaf and Hard-of-Hearing People, which is no longer in publication. When movies first appeared in the theaters, they had no sound. A sequence of flickering motion was followed by a slide containing some dialog or narration (gee — captions! ), which was then followed by more flickering motion. Deaf and hearing viewers had the same experience at the movies, except for the accompanying music. When sound became a part of the movie experience, the movies began to rely on the sound to communicate the plot, and deaf people could no longer share the experience. This trend was sealed by the time television took off. It took many years for closed captioning to come along and save the day. When I started playing computer games in the mid-1970’s, they were mostly textual. If a game had two distinctly different beep sounds, that was pretty impressive audio technology. When playing a text game, a deaf player and a hearing player were on equal footing, because there was anothing to hear. Does this sound familiar so far? Even as recently as a few years ago, game writers assumed that the majority of the people playing their games would not have computers with speakers, so sound performed a purely ancillary role. Even at that point, it made no difference whether you could hear. Now, with sound cards for your PC selling for under $20, and virtually all new computers having sound capabilities built in, history is repeating itself. Computer games have critical instructions, tips, and clues in audio form. With many of these games, it is virtually impossible for a deaf player to get past the introduction. 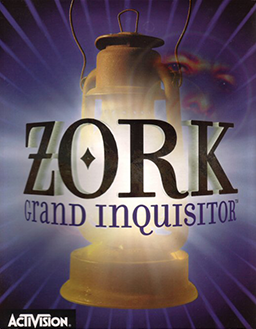 I was recently approached by Activision to test their newest adventure game, Zork Grand Inquisitor. Why me? Because the game is closed captioned! Not just captioned (i.e. subtitled), but closed captioned, meaning that the captions can be turned on and off. In “normal” play, Zork Grand Inquisitor has a black bar at the bottom of the screen. When you turn on the captions, they appear in this black bar, and faithfully reproduce the dialog and some of the sound effects. In fact, words that are extremely difficult to make out in the audio are clearly visible in the captions, making the captioning a great tool even for the hearing player. The captions appear as clear, readable colored text on the black background, in upper- and lower-case. They appear “pop-on” style like a captioned video rather than “roll-up” like live news or sports. In the time I spent playing, I found no significant dialog missing, and only one glitch in the captioning: a particular sentence that flashed on and off the screen before I could read it. The captioning was remarkably well integrated into the flow of the game, and after playing for a few hours, you forget that non-captioned games even exist. This is the way it’s supposed to work! One minor complaint, though. Nowhere on the box do we see the familiar “CC” symbol. How is a deaf person to know that this game (clearly labeled as having “Qsound”) is captioned? I congratulate Activision for taking the initiative and for doing a good job of implementing captioning in Zork Grand Inquisitor. They’ve set an example that I hope all the other game companies will follow. Posted on 10 September 2014, in Blog and tagged Activision, captioned games, CC, closed captioning, Gary Robson on Captioning, Newswaves, video games, Zork, Zork Grand Inquisitor. Bookmark the permalink. Leave a comment.